F&S scores again with a serious 75-foot fishing machine equipped with head turning good looks and luxurious accommodations. 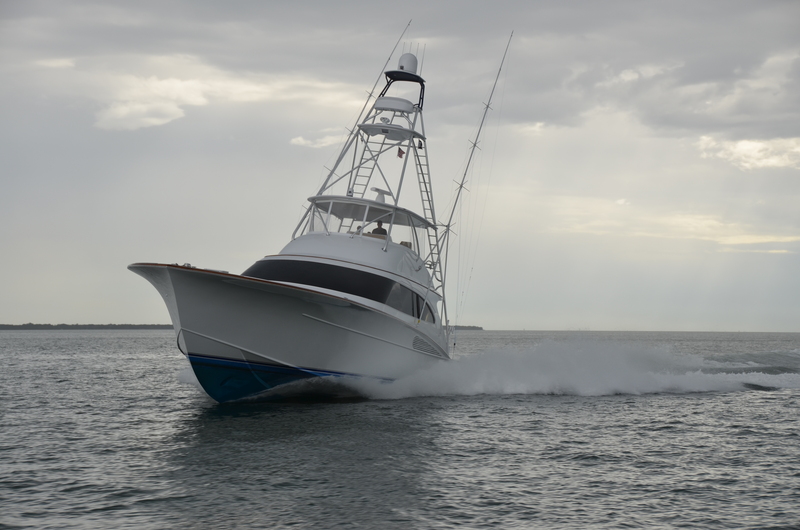 In the realm of big custom sport fishing boats, Blue Time is all about power, performance, and outstanding amenities. 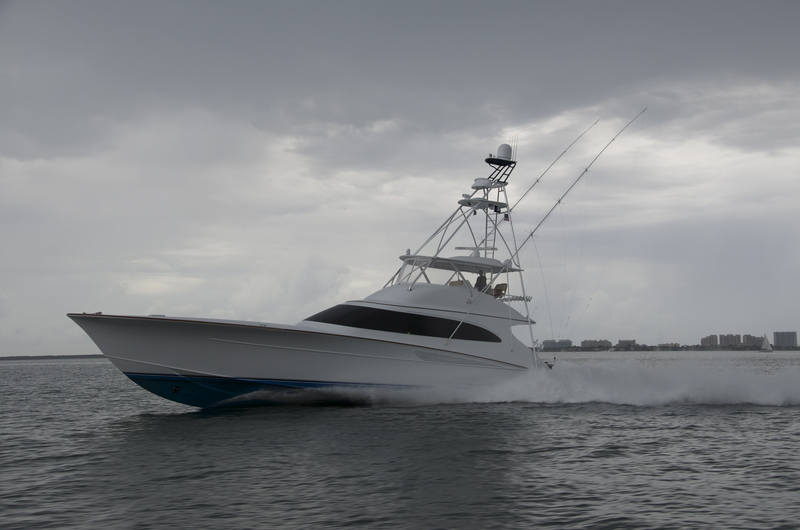 Blue Time, the latest 75-footer from prestigious Delaware-based F&S Boatworks is a single-minded, impeccably built custom boat whose function and purpose, in fact the very reason she was launched, is to be a viable player on the fishing circuit. In between their visits to other builders, a 72-foot F&S named Momo came into their homeport at the Cocoplums Yacht Club in Coral Gables, Florida. That visit and the ensuing getting-to-know-you-time resulted in a phone call to Jim Floyd, the company’s inspirational founding force and a respected industry personality, at F&S. Finding out a 75 jig was available, they came to terms and Blue Time was contracted to be built. Form ever follows function is the phrase that easily comes to mind when either admiring Blue Time’s lines as she sits in the dock or even better, underway. Her design, shape, and very profile are first and foremost based on her intended purpose. Low, sleek, and appearing as if in constant motion, she is in perfect proportion to her length and visually, whether from the landing strip foredeck, the gentle slope of the house with its familiar black brow, to the open bridge design with its massive, and fully functional, Palm Beach tower and substantial hydraulically-operated Rupp ‘riggers, and finally to her cockpit and transom, everything about Blue Time is in harmony and balance. And even up on the bow, her removable casting station and flush-mounted livewell makes sense. 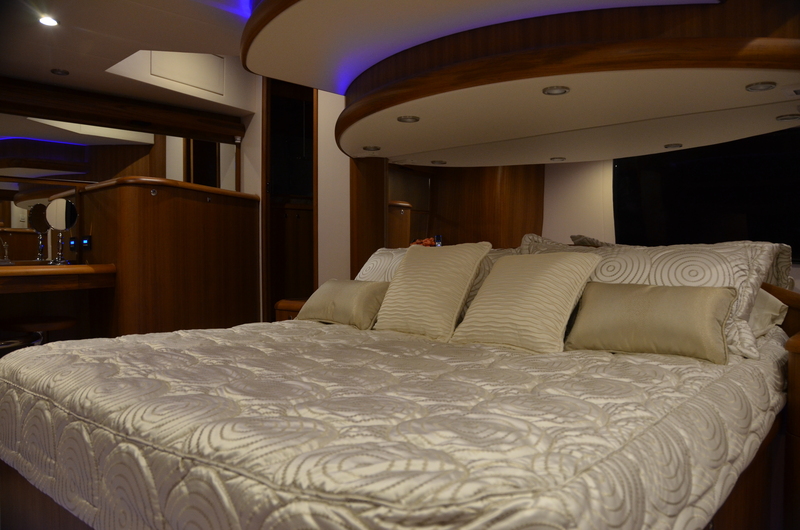 Blue Time’s owner wanted the kind of creature comforts only a big boat could supply. And with Capt. Bill working closely with the F&S designers and planners, the accommodations layout delivers on all counts. While her exterior profile shows off her well-balanced design, Blue Time‘s interior is just as exciting. The expansive salon has C-shape seating to port with a Release-built, custom teak table featuring storage below. “They made it so we could have this space for taking meals as well,” Capt. Bill demonstrated as he showed me how easily it transforms into a dining platform. Forward is the fully found galley and opposite, a spacious dinette under which is an electrically operated rod storage drawer. Of particular note here is the distinctive overhead cutout that adds an effective and special design statement to the area. A beautiful wood console houses a 75” HD television, electrical panel, bar, and as everywhere aboard, contains extra storage spaces. The full beam master offers comfort in luxurious surroundings. 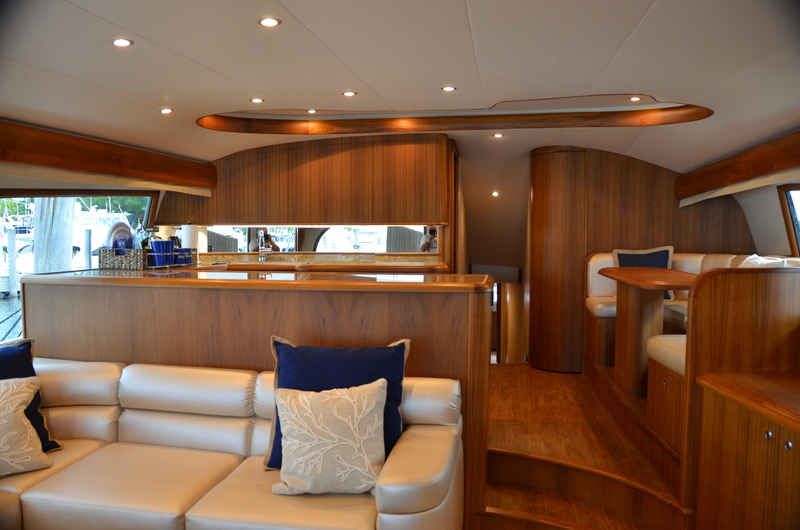 Blue Time has a four stateroom, five head layout with a full beam master; one that has its own 75” HD television as well. And no matter where I visited in the accommodations areas, I found superior woodwork, excellent headroom, fastidious attention to details, more than ample space for all fishing tackle and gear, including a dedicated walk-in closet forward of the galley for kites and related equipment. Capt. Bill also made particular note of the electronics and a.v. wiring. And after looking around inside the various dedicated cabinets and closets, I could see why. All Hooked Up Electronics owner Koby Money gave Blue Time the kind of wiring job that is second to none, affording the system-savvy captain, or technician, unfettered access to any work or maintenance that may be required. “We do a lot of live bait fishing, perhaps eighty percent of the time, so we wanted to make her, and as big as she is, complete with some innovations we feel many of the other rigs do not have,” Capt. Bill said as we reviewed the inventory list of fishing amenities. Among other tourney equipment, Blue Time‘s business end features a 170 square foot teak cockpit with a pair of removable live wells to either side of her custom Release chair. He had the transom designed for a pair of 55-gallon live wells with the ability to run both with just one pump. The wells can also be pressurized while the boat is running to prevent any sloshing around in a big sea and injuring or killing the bait. Other features of the 170 square foot cockpit includes the mezzanine seating area, tackle storage, three large stainless steel lined freezers, a pair of KEP networked monitors, a Freeman watertight lazarette hatch, tuna tubes in aft bait wells, and Eskimo ice maker among many other accessories. With her busy fishing schedule, being able to transition quickly over to species-specific techniques is an important ability for the crew. There are spreaders all the way around on the tower and the entire area around the boat can be lit up at night for dipping bait. And when I climbed to the top, I found a gray painted platform underfoot to cut down on glare, all the antennas placed topside, and all the controls, wheel, and equipment set just right to allow Capt. Bill to have optimum visuals while fishing. Abundant room makes this engine space as special as they come for any kind of maintenance and service. Big boat, big engine room, big space to move around in. There’s no argument here; with a 75-foot length and 20’9” of beam, Blue Time has the kind of engine room that offers space, space, and more space. 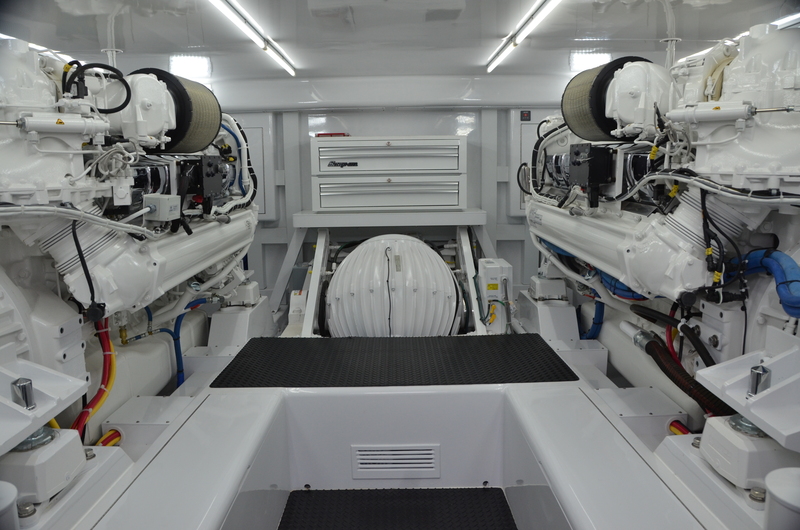 From the considerably sized 2,600-hp MTU mains, to the pair of 32-kW Cummins Onan gensets, to the M26000 Seakeeper gyro mounted in its own custom made cradle on the centerline and forward of the engines, to all of the pumps, water management and air conditioning systems, to the battery banks and electricals, FCI 1,200 gpd watermaker, and any and all critical maintenance and service areas, I found ample room to swing any kind of tool without getting into any knuckle-busting, elbow twisting, head banging, or body-contorting situation. And of course, it’s all brightly lit and faired and finished off as meticulously as is her flawless Allcraft White 2000 painted hull. Blue Time’s build took around 20 months and as with all boats of her class, there were challenges to be met including keeping all the necessary headroom and supplying the large storage spaces aboard, especially those associated with her fishing profile. She is built using diagonal planked Okoume plywood, three ¼” layers on the sides, three ½” on the bottom, with one extra layer of ½” on the bottom of the engine room. Next comes one complete layer of 17-ounce biaxial cloth between the second and third layers of plywood after which two complete layers of that same cloth are placed on the entire exterior of the hull. A layer of 12-ounce of Kevlar covers the bottom and another layer of 17-ounce is placed on the complete interior from the chines down. All the stringers, shear, chines, and keel are constructed of clear, vertical grain Douglas fir while the topsides, from the shear up, are of Corecell and biaxial cloth. Running on her variable deadrise bottom with longitudinal steps, a design derived from Floyd’s SeaCraft days and one that he has adapted and evolved over the years to the sportfish sector, Blue Time is a spirited performer. A pair of M94 2,600-hp MTU diesels, turning 38 x 56 Veem Interceptor 5-blade wheels, powers her. Blue Time turned in impressive performance numbers and offered nimble handling during all phases of my sea trial. 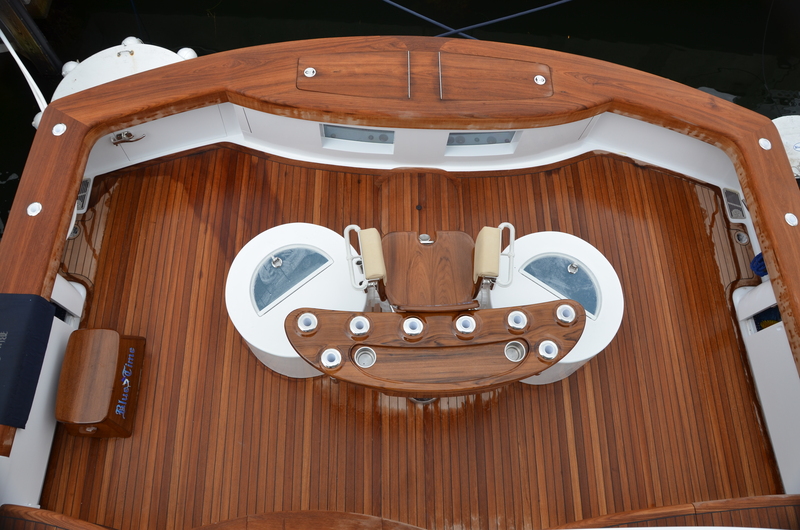 Being a release rather than a pressure design, the effect is a somewhat softer ride due to the aeration along the steps as pockets of air are trapped between the hull and the surface by those steps. That is transferred to the hull as it moves through the water. And while test day saw calm seas with only a slight breeze of no consequence, Capt. 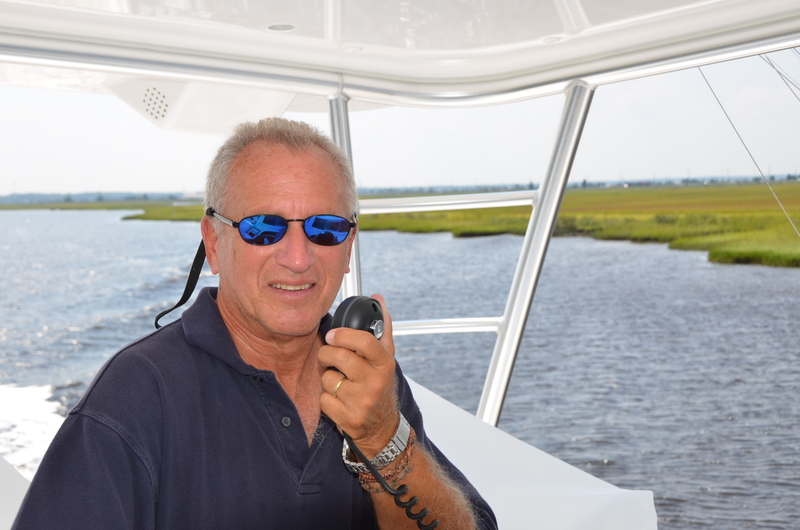 Bill, on his delivery run, did comment on her ability to cut through head-on and quartering waves and excellent stability with following seas. She jumped quickly up out of the hole and settled into an impressive 37-knot cruise speed at 2000 rpm, a 40+knot turn at 2150 rpm, and flirted with almost 46 knots of speed with the throttles pinned. With the multi-keel effect of the vertical surfaces of the steps, she displayed superior directional stability and tracked straight and true during flat out speed runs. 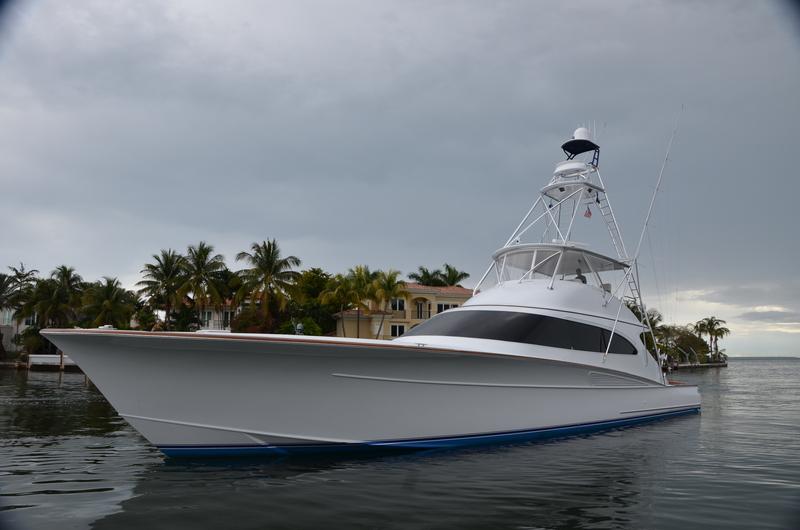 So far, and since her launching in late December 2014, Blue Time has participated in the Sailfish 400, the Sailfish Challenge, and the upcoming Jimmy Johnson; perhaps, if their schedule allows, the Key West Tournament, some marlin fishing in the Abacos, possibly the Custom Boat Shootout, maybe a BBC or two, and a handful of others. “That’s what we’re all about,” said Capt. Bill. With a boat like Blue Time, I couldn’t agree more.